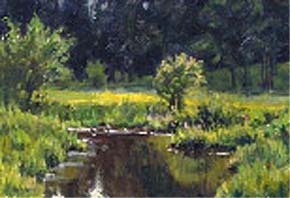 Ian Roberts shares more than 30 years of experience of plein air painting. Shot in the magnificent landscape and light of Provence, France, he gives you the feeling of being with him on one of his workshops. A terrific teacher with a warm and engaging teaching style, his ability led a course participant to say: Ian’s teaching skills are phenomenal. He’s able to meet a painter where they are, guide them at that level, with encouragement and precise insight. Knowing the most common problems that can arise and the elements that must come together for a painting to work, he has crafted a one-hour video packed with knowledge, insights and tips to paint the landscape en plein air. Start with the fundamentals, Ian talks about the major factors in all representational painting, regardless of genre or medium: composition, value and color. He offers examples, ideas and exercises to improve all three. 60 min.